Home » News » Calgary REALTORS – Please Support Us! Hearts and Hammers has been nominated as a potential recipient of one of the fifteen grants of $10,000 given to a Calgary area charity by the CREB® Investing in Hope Program . The grant recipients will be determined by CREB® members and staff through an exclusive online voting program. Our nomination is in the Shelter category, which is based on shelter-related initiatives. If you are not familiar with what our team does, please check out our goals on our website. 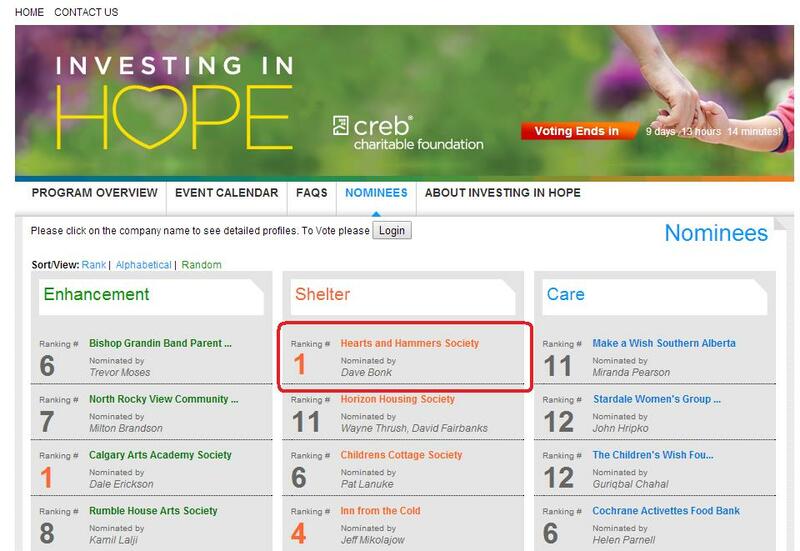 And review our nomination page on the CREB® Investing in Hope Program website. We hope that you find what we are doing to help mobility challenged individuals in need remain in their homes is worthy of your support. As only CREB® members are eligible to vote, we would be most appreciative of receiving your support and your vote. And for all the readers who are not a REALTOR, please ask your favorite REALTOR to vote for us. Thanks! Voting closes on Thursday, Oct. 22 at 12:10PM so please vote now!